With an unbeatable mix of security features and value for storing your most treasured valuables. Amenities include an attractive interior upholstery, a door organizer kit, rifle shelving, and a chrome three spoke handle. Standard security features include our easy access electronic lock, four 4 inch locking bolts, patented tru-lock internal hinges, triple hard plate to protect the lock, a 45-minute fire rating, and a triple fin smoke seal. Backed by the Cannon Safe lifetime replacement promise, the cannon standard Series safes are the perfect solution for secure storage and organization of electronics, heirlooms, cash, paperwork, jewelry, firearms, and other valuables. 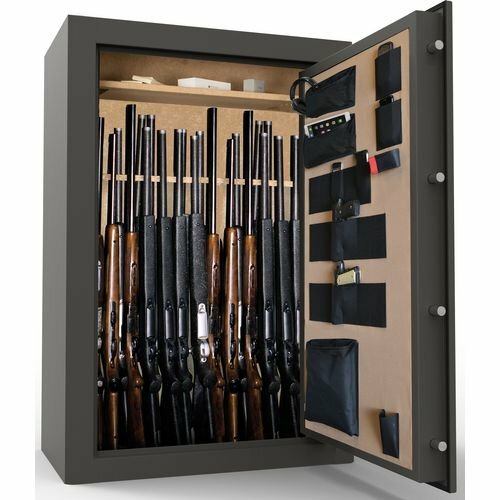 This safe is California DOJ approved. If you have any questions about this product by Cannon Safe, contact us by completing and submitting the form below. If you are looking for a specif part number, please include it with your message.